He holds a Bachelor of Law LLB (Hons) degree from Abia State University Uturu and Barrister at Law (BL) Nigerian Law School. 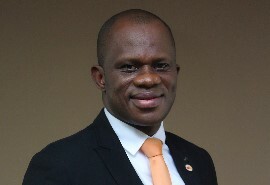 Prior to his joining Cowry Asset in April 2008, he worked with notable law firms as a Legal Practitioner. In 2002, he served as Personal Assistance to the Senior Special Assistance on Legislative Matter to the then Governor of Abia State. Due to his hard work and commitment to duty, he was appointed as Special Assistance to the then Transition Chairman of Ukwa West Local Government in 2003. Before assuming his present position as the Company Secretary. occur in which toil and pain can procure him some great pleasure. "to create exceptional wealth for our stakeholders"
"to be the foremost pan-african wealth creating financial services provider of global repute"
Copyrights � 2017 All Rights Reserved. Powered by Cowry.